Specialist process machinery manufacturer, L.B. Bohle, has developed a cleaning system for the pharmaceutical industry using Bürkert's innovative FloWave flowmeter for a compact, hygienic and very accurate process. Incorporating the latest in flow measurement technology has minimised equipment footprint and reduced operating costs as well as maintenance time. In the food, beverage, pharmaceutical and cosmetics industries, flowmeters need to deliver high precision feedback while also meeting hygiene standards. The FloWave flowmeter uses surface acoustic wave (SAW) technology to deliver precision measurements from a very compact unit, with no in-line flow restrictions, even in turbulent or contaminated flow. L.B. 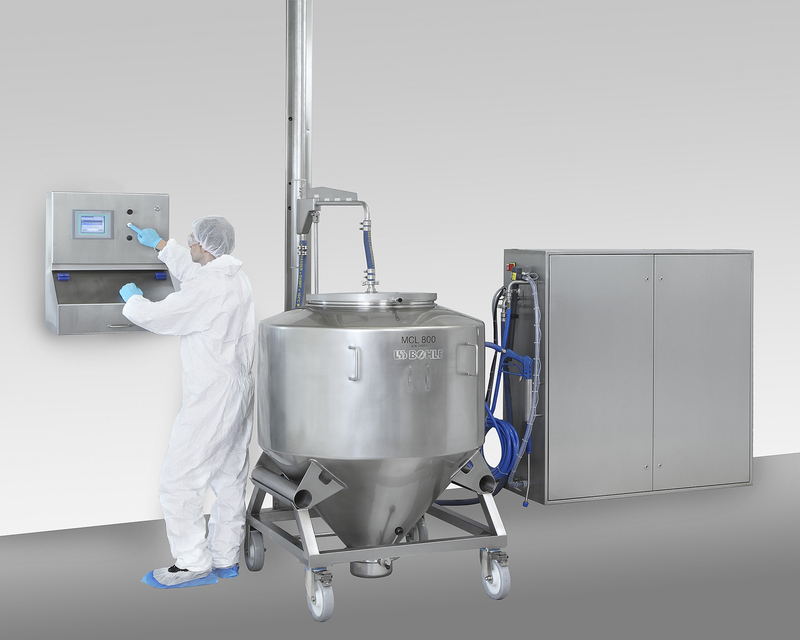 Bohle is a recognised specialist in this field and has established itself with its machinery and equipment for the pharmaceutical industry, ranging from scales, granulators, sieves and mixers to tablet film coaters and the corresponding cleaning equipment. These include the compact pharmaceutical universal cleaning system PUR, which is designed specifically for cleaning containers of a variety of sizes. The recipes for the various cleaning processes contain the proportions of water relative to the alkaline or acidic cleaning agents. Normally, the mixing proportions range between 1 and 3%, with cleaning solutions of all pH levels being used. Flowrates are measured using the flowmeter, which works with an uninterrupted tube that exactly matches the diameter of the inlet and outlet pipes. Bürkert¹s designers have created an ideal flowmeter for CIP where none of the sensor components are in direct contact with the fluid and which causes no restriction to flow. Having installed the new flowmeter, L.B. Bohle has since been impressed with numerous benefits offered by these flowmeters in practical use. The product is ideally suited to hygienic applications with the measuring tube manufactured to the same surface finish as the rest of the pipeline, meaning that in terms of hygiene, cleaning and flow conditions, there is no difference to any other piece of straight pipe.